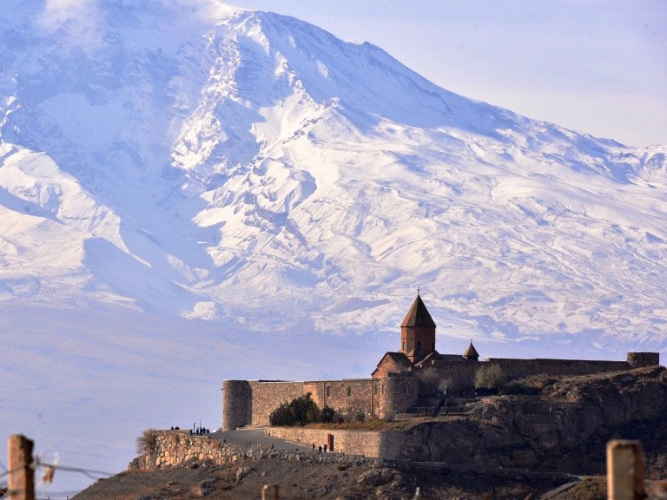 With this Day Trip from Tbilisi To Armenia you will explore the best of the Northern Armenia and the region called Lori. If you’re staying in Tbilisi and want to visit Armenia for a day to get a taste of this beautiful country, this trip is perfect for you. Our guide will meet you at your hotel and lead you to your car to begin the Armenia One day Tour. Our day will start by a direct drive to Sadakhlo border of Georgia and Armenia. Along the way, you’ll find out about the relations between these two countries. After crossing the border, we’ll be touring in the northern part of Armenia, in the region called Lori. This is the greenest region of Armenia with more than 65% of the forests located here. Heading up the Debed canyon, first we’re going to stop by the ghost town of Alaverdi – A mining city during the soviet union, now it houses huge empty factories and looks very much like a Hollywood movie! Next, we continue to visit Sanahin Monastery UNESCO World Heritage Sight and explore this puzzling complex. Built in 10th century, it still stands strong and tells us stories of the past. Here we’ll have an opportunity to take a look at exquisite Khachkars – famous cross stones of Armenia. Afterwards we make a short stop at the Museum of Mikoyan brothers, coming from the tiny village of Sanahin, they had a huge impact on the soviet union and also the world. Artem Mikoyan is the mastermind behind MIG Airplanes. As for Anastas Mikoyan, he was a high ranking statesman in Soviet Union. We stop at the museum to take a look at a real MIG aircraft. After exploring Sanahin,It’s time to explore another cornerstone of Armenian Culture – Armenian Cuisine! We’re going to get a taste of the Armenian cuisine and this country’s delicious BBQ – “Khoravats”. Next, we continue to Haghpat monastery built in the same time period as the sister monastery of Sanahin. Having been the center of Armenian Church and having encountered numerous invasions, this sight holds a lot of history. As a bonus – It’s located in a stunning location offering amazing views of the surrounding mountains. Our final stop for the day is Akhtala fortress known for its amazing murals preserved in amazing condition. Originally painted in the 13th century, the frescoes look brand new! This is mostly thanks to the little sources of light in the Church and also the special pigments used by the artists. This will conclude the Day Trip to Armenia from Tbilisi. We’ll cross the Sadakhlo border on foot. If you don’t need a visa, we’ll walk right through. If visa is required and you’re eligible for Visa on arrival, you can get it here. Please make sure you check your visa eligibility before the tour. We’ll stop on a roadside for a view of Alaverdi – a soviet mining town. In the USSR times this place was a big industrial center, but after the collapse – the industry has followed. The city is half empty and looks very much like a Hollywood zombie movie can be filmed here. Stop at the 10th century monastery of Sanahin – a UNESCO World heritage sight. Explore the full complex with the guide and find out about its past, present and future. Mikoyan brothers are from the Armenian Elite society. One of them was a minister of foreign affairs in Soviet Union, while the other one – an aircraft engineer. Later, is known for the MIG airplanes. We’ll make a quick stop at the museum to take a look at a real MIG 21 fighter jet. We’ll make a stop at a well known traditional restaurant to get to know Armenian cuisine closer. We’ll try many Armenian dishes and most importantly the famous BBQ – Khoravats! After the lunch, we’ll explore yet another UNESCO World heritage sight – Haghpat Monastery. Same as the Sanahin – this monastery was constructed 1000 years ago. We’ll visit all of the important buildings of the complex to get a full understanding of how life was here throughout centuries. Akhtala fortress is located closer to the Georgia-Armenia border. It’s a fortress from the 11th century and boasts a beautiful cathedral with unique murals. We’ll walk through the whole complex to enjoy it’s gorgeous architecture and surrounding landscape. We’re going to cross the border back into Georgia and head for Tbilisi. At around 19:00, we’ll get back to Tbilisi and our team will deliver you to your hotel. Firman pomo Irakli vei minua, vaimoa ja kahta japanilaista turistia kohtia Armenian puolella olevia Unesco-nähtävyyksiä. Matka kuitenkin pysähtyi Armenian puolella mielenosoittajien pystyttämiin mielenosoituksiin. Maassa oli poliittinen härdeli menossa. Jouduimme palaamaan Tbilisiin. Matkalle Irakli kuitenkin kertoi paljon kiinnostavia ja hauskoja asioita Georgiasta ja Armeniasta. Hän puhui erinomaista englantia. Miellyttävä kaveri kaiken kaikkiaan. Ensi reissulla uusi yritys Kartveli Toursin kyydissä. Antoi vakuuttavan ja vastuullisen kuvan toiminnastaan. We did two day tours with them- the wine tour and Armenia tour. They were both great but we preferred the Armenia tour. Both guides were friendly and helpful but not overbearing. What we appreciated most was the authenticity of it – we didn’t get hassled to go to tourist traps, and loved the lunches in both a local’s house as well as a great restaurant. I wish all tour companies ran like this! A friend and I traveled for our spring break. We signed up for one tour and ended up having such an amazing time on our day trip to Armenia that we decided to sign up for the Kazbegi tour as well two days later. Kartveli tours is super accommodating! We were a few minutes late with an extra person and they fluctuated the group into a bigger van only losing 10 minutes from the planned exit time. They plan the activities perfectly (i.e. not too long in the car, amazing local cuisine, beautiful scenery, knowledgable guides, etc.). I highly recommend Kartveli Tours!!! Booked a day tour to Armenia and had a blast! Our guide, Irakli, was simply amazing. He knows a lot, has a great sense of humor and he clearly loves his job. That’s why we decided to book two more tours with Karveli, both equally awesome! Felt very safe in the car, even in the crazy Georgian traffic. The driver was just the friendliest guy ever and by far the best chauffeur we’ve had. Enough time for photo stops and even a detour! Can’t recommend this company enough!